This is going to be a super cozy, festive themed post so go grab a cup of tea and your slippers before you start reading! Now, I can't be the only one that at this time of year starts burning a tonne more candles, buying more blankets and spending my days off in my pyjamas scrolling through festive homeware and Christmas gift guides. Therefore, It's no secret that I love changing my flat throughout the seasons to keep up with bright colours in Spring and Summer and cozy details in Autumn/Winter, so I thought I'd share with you my favourite festive and Christmassy home accessories and decorations this year from the top brands including House of Fraser, H&M and Next. 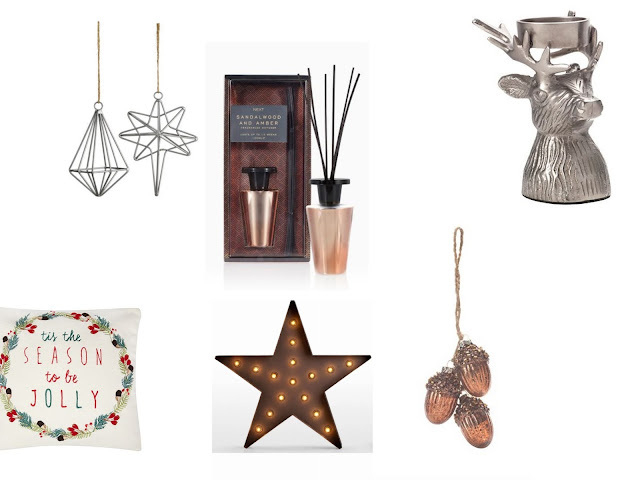 Tis' The Season Cushion, Sandalwood & Amber diffuser, Black Tree Decorations, Star Floor Lamp, Reindeer Tealight Holder, Bronze Acorn Decorations. I am obsessed with copper and silver for the Festive Period when it comes to decorating, especially with a tonne of fairy lights it just sets the perfect scene. The H&M silver tree decorations and the House of Fraser copper acorns will look gorgeous this year on a lightly dusted Christmas Tree, surrounded by beautiful throws and this adorable Tis' The Season cushion! I'm so excited to pick some of these pieces up and really go to town on my decorating this year - who says Christmas living alone can't be glam? Go see what else my favourite brands are offering here, here and here! *This was a paid post in collaboration with House of Fraser for their festive collection, however all thoughts and opinions are my own.